On The Great Inland Way, 78kms to the south of Roma along the Carnarvon Highway you will find the picturesque township of Surat. Historically the site of a Cobb & Co changing station, the Surat community has, with much dedication, preserved this precious remnant of their history. Surat is just the place to immerse yourself in natural tranquilly on the banks of the beautiful Balonne River. Enjoy a stroll along the Surat Riverwalk which follows the Balonne River for approximately 2kms and features leisure equipment, excellent footbridges and a spectacular viewing platform overlooking the river. Continue your stroll through the picturesque Lions Park to the main street businesses. Continue on and around the corner to walk by the grand 1930’s Shire Hall. On your way back stop in at the Cobb & Co Changing Station Museum which is located at the original site of the Cobb & Co Store and was the drop off point for coach passengers and goods, the Changing Station now houses an amazing 25,000L freshwater aquarium, social history museum and regional art gallery. Travel along the Cobb & Co Way between Surat and Yuleba, following the route taken by the last Cobb & Co coach service in Australia, with interpretive signs along the way. Don't miss the iconic spots and hidden gems. 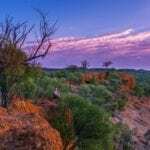 No matter where you go in the Outback, there are amazing itineraries for you to explore.